Once known as Android Market, the Google Play Store is the primary marketplace for Android apps and games, as well as additional content from Google, including movies, TV shows, music, books and more. The Google Play Store can be accessed both from the Android device itself and through a web browser on a computer. Using the Play Store may seem daunting at first, but it's actually very easy to use and enjoy. To download apps and games from the Google Play Store, you must first connect your Android device to your Google account. This is both for free apps and for paid apps. In the case of paid apps, the cost can come out of a credit card connected to your Google Wallet account or, if supported, via carrier billing with your wireless provider. After a brief period, which could be up to an hour, your Android device will appear on the Google Play Settings page when you log in via a web browser on your computer. While you need to wait for this to occur to buy or download apps via a web browser, you can immediately start shopping for and downloading apps from the Android device directly. Make sure you are connected to the Internet, either via Wi-Fi or 3G/4G. It is recommended to download larger apps over Wi-Fi to minimize data usage. Open the Play Store app. This is located on the home screen by default, but can otherwise be found through the main app drawer. Choose "Apps" from the buttons located near the top of the screen. 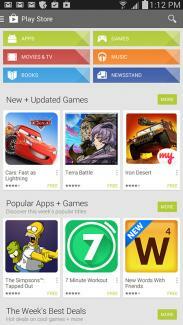 New, updated and popular apps and games are also highlighted on this main page. Tap the magnifying glass icon in the top-right corner to search for a specific app title. Alternatively, you can browse through available apps by choosing "Categories" from the navigation near the top or browse the recommendations on the "home" tab. Tap the app that you wish to download or purchase. Tap "Install" or the corresponding price button for paid apps. Review the permissions required by the app. When an Android device is connected to your Google account, you are able to 'push' apps via a web browser, over the Internet, to your Android smartphone or tablet. The download may not start immediately, but it will be queued to begin in a reasonably prompt manner. Visit play.google.com on your computer. Log in to your Google account if you have not already done so. Choose "Apps" from the navigation buttons in the left sidebar. Search for a specific app using the Search field at the top of the page or browse for an app via the pull-down category menu or through the recommendations shown on the main Apps page. Click on the app that you wish to download. Click the "Install" button or the corresponding price button for paid apps. Review the required access permissions. Choose your device from the pull-down menu if you have multiple Android devices connected to your Google account. These same lists can be accessed via the web browser version of the Google Play Store by choosing "Top Charts" from the links near the top of the page. Is your Google account properly linked to your Android device? Is your Android device connected to the Internet? Do you have payment methods set up in Google Wallet for paid apps and in-app purchases? Is the app compatible with your Android device? The compatibility is shown on the app detail page when viewed through a web browser. Are you using the right account? If you have multiple Google accounts linked to your device, you may need to switch to the account you wish to use by changing the Google Play Store settings on your phone. This is found in the left sidebar. The Amazon Appstore for Android is also a good alternative marketplace for finding Android apps and games if you cannot find what you want through the Google Play Store. Gift cards for the Google Play Store can be purchased from a number of convenience stores, grocery stores, electronics stores and other retail outlets. These gift cards contain special redemption codes that can then provide account credit value to be used on Google Play Store purchases. Tap the three horizontal lines near the top next to the words "Play Store"
You may want to un-install or delete an app from your Android smartphone or tablet for whatever reason. There are at least two ways to do this. Even when an app is deleted or uninstalled from an Android device, the app is still connected to the Google account that was originally used to download or purchase the app. Should you choose to re-install the app in the future, you will not need to pay for it again. The iTunes App Store for the Apple iPhone is a remarkably large marketplace for all sorts of useful apps and fun games, but the Google Play Store for Android devices is equally impressive in its selection and ease of use. Whether you're looking for a casual puzzle game or serious productivity software, there's an Android app for that through Google Play.